One of the most important trends in our world today, is the Trend of Convenience. It's what is shaping how products are made, how the digital world is changing, and how business models are transformed. But most people don't realize how it actually works. The 'Trend of Convenience' doesn't make things more convenient. Instead it mostly eliminates limitations that prevent change from happening in the first place. Take the horse carriage versus the car. 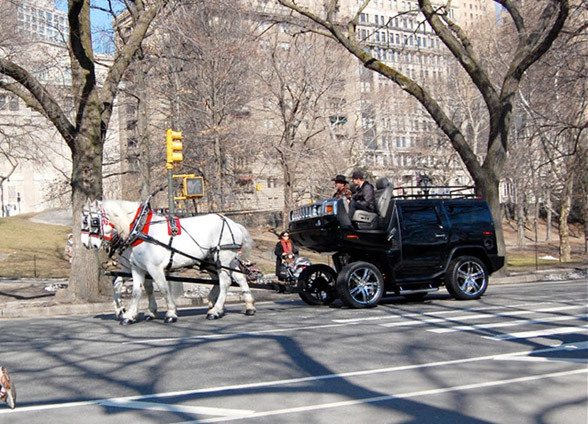 Many people think of the car as a more convenient horse carriage, but why is that? Is it because it's faster? Is it because it's more comfortable inside? Is it because it comes with heated seats and a stereo? The most inconvenient element is not the carriage, it's the horses. If you owned a horse carriage in the 1850s, you'd have to get up every morning to feed and water them. You'd have to build a stable to keep them safe, with a grassy field where they could walk around. If you had to go somewhere, you couldn't just drive there and then park your horses at the side of the road. Your horse had to be taken care of while you were gone (especially for longer periods of time). The reason why we invented the car was not to create a better horse carriage. It was to find a way to eliminate the horses. The horses were a limitation of the past, and the role of the 'Trend of Convenience' is to eliminate any limitation that prevents us from moving forward. The Trend of Convenience didn't create a faster horse, it eliminated the horse altogether because it was holding us back. And once the limitation had been removed, the shift happened. It's also the Trend of Convenience that is responsible for the robot evolution, the miniaturization revolution, and the many startups focusing on automatization via the cloud. Let's talk about this in relation to print. While print is probably one of most important inventions in the history of Earth, it's also exceptionally limiting. First we have the limitation of time. Print has to be produced and distributed before people can see it. That takes a long time. Then we have the limitation of distance. Print has to be shipped from A to B, and that takes even longer.